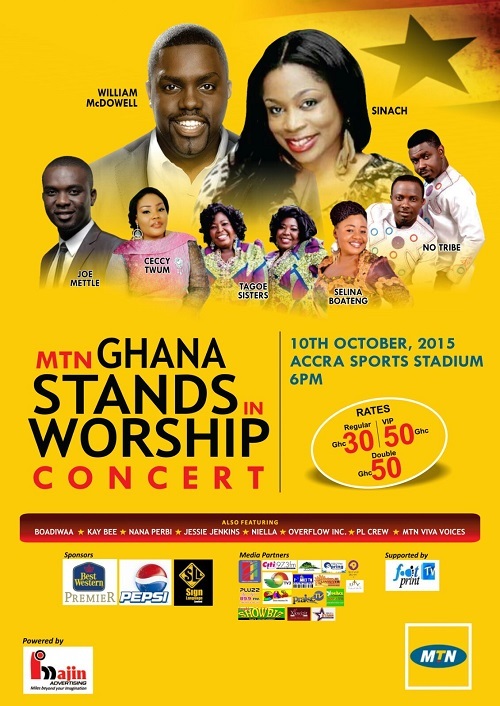 The much anticipated MTN Ghana Stands In Worship event is finally here and GospelGh is devoted in bringing you a minute by minute account of all that is happening with International gospel singers William McDowell(USA) and Sinach (Nigeria) and best worship leaders of our land; No Tribe, Tagoe Sisters, Joe Mettle, Ceccy Twum, Selina Boateng, Boadiwaa and many more. From below, don’t miss any moment as we bring you LIVE UPDATES of the event from the Accra Sport Stadium. Read or join us tweet with #GSIW. Joyce Blessing touches down for ‘I Swerve You’ tour in USA.